The Tangerine Ocellaris have heavily hindered melanin production. 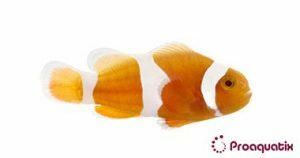 Consequently, they are bright orange fish with solid white stripes. They have no black between the bars nor do they fade from top to bottom. What little melanin is produced seems to be limited to the pelvic fins.